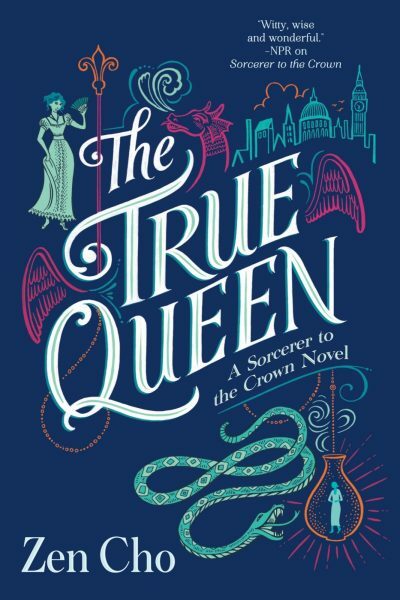 2019’s The True Queen is the second volume in Zen Cho’s Sorcerer to the Crown series. Amnesiacs Sakti and Muna arrive on the island of Janda Baik, preceded by a great storm. They know their own names, but nothing else of their past. They look much like each other, so it is supposed that they are sisters. They are offered a home by the formidable witch Mak Genggang and begin to make new lives for themselves. Sakti is brimming with magic; Muna has none. Muna’s deficiencyis the result of a curse or so Mak Genggang assertsSakti also seems to be cursed; she is slowly being erased. Oddly enough, she blames her benefactor Mak Genggang for the curse. Janda Baik has the misfortune to be all too close to Malacca, now owned by the English. The English have designs upon Janda Baik. The island has been saved from annexation only by its magical defences. Sakti’s bold efforts to find a cure are complicating the political situation. Mak Genggang resolves to send the two young women to England. The English Sorceress Royal has established a college for magically gifted women; the Sorceress Royal is a friend of Mak Genggang and can be trusted to protect the odd pair. A ship would take too long. Mak Genggang sends Sakti and Muna through the Unseen Realm, which the English call Faerie. Alas, the young women are cautious, but not cautious enough. Only Muna arrives in England. Her sister vanishes, carried off to who knows what fate. The college was expecting two magically adept sisters. Faced with but one, they offer Muna the place she and her sister would have had. It’s a safe refuge from which to consider how to rescue Sakti from the Unseen Realm. Muna has not even the smallest jot of magic. She does, however, have new friends. An ill chance further complicates things. The Faerie Queen is convinced that the Sorceress Royal has stolen a valuable amulet. Faerie is willing to go to war for the trinket. This is bad luck for any innocent bystanders too close to the Sorceress Royal…. How odd that gifting people with powerful magic does not make the unwise any wiser. Surely power should be the same as wisdom? Apparently not. It’s not at all hard to work out who Sakti and Muna might be. Good thing that this mystery is not the heart of the novel. The book focuses on Muna: her journey of discovery, the relationships she builds in England, the truth of her past, the uncomfortable choices she must make. Has it really been three years since Sorcerer to the Crown? Alas yes. This book is a sequel, but it is also a standalone work. It will be marginally more accessible if the reader is familiar with Sorcerer to the Crown, but reading Sorcerer is in no way necessary if one is to enjoy this book. This is an engaging coming of age story, one worthy of the original. One hopes the third novel will not be quite so long in coming. The True Queen is available here (Amazon), here (Amazon.ca) and here (Chapters-Indigo).